Screen Training Ireland (STI) is delighted to announce three new appointments to the current team. Sorcha Scully has been appointed to the positon of Animation and VFX Coordinator, Emer MacAvin has been appointed as Apprenticeship and Traineeship Executive and Sharon O'Hara has been appointed as the Marketing and Communications Coordinator for Screen Training Ireland. Sorcha will be tasked with the roll out of training and skills development activities across animation, VFX, AR/VR and gaming. Emer will look after work-based learning initiatives including structured Apprenticeships and Traineeships. Sharon will work across all marketing and communications activity for Screen Training Ireland including the website, social media content, newsletters and industry and public engagement. Sharon will also oversee data protection and freedom of information compliance for Screen Training Ireland. Speaking about the new appointments, Gareth Lee, Manager of Screen Training Ireland, said "We are delighted to welcome Sorcha, Emer and Sharon to Screen Training Ireland's growing team. Sorcha will play a key role in identifying and responding to skills gaps in the animation, VFX and games sectors; Emer will be heavily involved in all of STI's work-based learning programmes; and Sharon will take on the challenge of marketing Screen Training Ireland's skills development initiatives through various communication channels." Sorcha Scully previously worked as a Sales Executive for Monster Entertainment, a brand management company which develops animated series and distributes them worldwide. While working at Monster Entertainment, Sorcha was an active member of the team and attended MIPCOM and MIPTV to showcase the companies exciting catalogue of animation for all ages from pre-school, through to animation for adults, including; Oscar winning, Oscar nominated and Emmy award winning animation. Sorcha holds a BA (Honours) Degree in English, Media & Cultural Studies from the Institute of Art Design & Technology, Dun Laoghaire. Emer MacAvin began her career in the Film and TV Industry in 1992 as a freelance trainee buyer, working up the ranks on various International and Irish feature films, TV series and TV commercials from Trainee Buyer to Buyer to Set Decorator. Some of the productions Emer worked on include King Arthur, PS I Love You, The Wind that Shakes the Barley, Disco Pigs and A Tigers Tail. Emer has worked at Screen Training Ireland as a Training Coordinator since 2007 on a range of training programmes in the technical, business development and creative areas. Emer holds a BA in Training and Education (NUIG), a Certificate in Training and Continuing Education with (NUIM) and a Certificate in Stage Craft Production. Sharon O'Hara has worked as a digital media producer for the past 6 years, primarily in the digital media and digital marketing space – creating content for pre-school properties like Peppa Pig and PJ Masks, managing social media and website content, and implementing marketing and communications campaigns at media companies like Entertainment One, Sony Pictures Television and Hachette UK. Sharon holds a first class BA (Joint Hons) Degree in English & Sociology from NUI Maynooth. 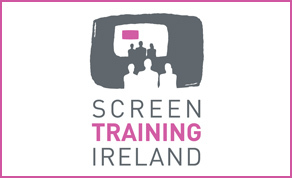 Screen Training Ireland (STI) is the national training and skills development resource specifically tailored for Ireland’s film and television industry. It was established to provide ongoing training and career development opportunities for professionals working in the screen industry. Screen Training Ireland delivers structured training and skills development initiatives to the Film and TV Drama, Animation, VFX, Games, AR/VR and the Television Broadcast sector.